Probably the biggest mistake you can make when you are buying a new pair of boots is getting a pair which doesn’t fit you well. Sure, you may love the way these boots look, but if you don’t feel comfortable in them or if they are the wrong size or width, nothing else matters, because you will never feel happy and well when wearing ill-fitting shoes. It is essential for your well-being, health and safety to always get properly fitting boots and shoes. The question is – how do you know which ones fit you best? People’s feet can change with time, change, hormonal and weight changes and due to overuse or health problems. This means that if you have been wearing a certain size while in your 20’s, you may need to switch to half or one size up as you get older. Feet can change size due to pregnancy, obesity, diabetes, bunions and other conditions. So, make sure that you properly measure the length as well as the width of your feet before you purchase a new pair of boots. Plus, don’t be alarmed if the measurements are different for both feet. It is perfectly natural that one foot is slightly longer or wider than the other. The trick is to pick boots which fit the larger foot! Try them on. Even if you want to purchase your new boots online, if you can – always try them on in a brick and mortar shoe store beforehand. This is especially important if you are opting for a brand or style which you haven’t worn before. All reputable manufacturers provide useful sizing information and instructions regarding their footwear on their websites, but still, it is much better if you try them on just in case, before ordering them. Tips for trying on boots. In order to get a proper feel of the fit of the boots, you should always try on both boots. Take the time to lace them up or zip them up, stand up and walk around for a while to get a feeling of how they fit. You shouldn’t feel any excessive tightness in the front, back or around the toes. The heel should lay comfortably snug in the boots – without feeling crammed, or slipping off. If your movements feel restricted or if the boots are causing pain in your feet – opt for a bigger or wider size! Slide your finger between the heel and the back of your shoe – you should have a distance of about a finger’s width in between them. No more and no less! Your toes must be at about ½ an inch from the front of the boots. If the toes feel smashed in together, ask for a wider style or wider size of the ones you have chosen. Many shoe makers provide the same boots with different widths to suit the different foot shapes of their customers. Also, wear the same type of socks which you will normally be wearing with these boots, and make sure you go to the store in the time of the day or evening when your feet are the most swollen and largest from work or other activities. Buying larger boots can also cause discomfort and can be unsafe, so don’t be tempted to buy ones which are too large, unless you want to ensure they have enough space for additional orthotics or inserts with cushioning and arch support! Large footwear can cause your heel to slip and slide around while walking. This can lead to painful blisters as well as to accidental tripping and falling. The toe box must allow for your toes to step freely on the insoles without being crushed into one another. Buying too tight boots can be extremely uncomfortable and could lead to painful blistering as well as to more serious foot injuries and problems, such as bunions or plantar fasciitis. Break in time. Most leather boots will need some break in time because the leather needs time to soften and to adapt to the shape of your feet. This though doesn’t mean that you should purchase boots which are way too tight or short and rely on the fact that the leather will expand, because it most likely won’t! Get the proper size or half a size larger than you normally wear. After that you can proceed to break the boots in by walking around with them at home, and applying moisture, heat or cold to help decrease the time needed for making them comfortable enough to wear. Take the time to examine the insoles. If they are overly cushioned, the boots will feel more snug and tight. If you want to wear your own orthotics, then choose a pair of boots which have removable insoles. Also, to keep your feet and boots from developing harmful and smelly bacteria and fungus, opt for boots which have moisture wicking insoles, and ones which can be removed periodically and washed separately from the shoes. Look at the form of the boots and compare it to the form of your feet. If the flex points of the two align properly, then the boots are suitable for you. If there is an obvious difference in the form, you should look for others which will suit and fit you better. Try out different types of boots when you are shopping. You may think that you have found the perfect boots, and may feel impatient to buy them, but do take the time to try out some alternative styles or brands as well. You never know when you can stumble upon an even better and more comfortable pair! Taking the time and spending the energy to find the boots which fit you perfectly will pay back in the short and in the long run. You want to get a new pair of boots which you will happily wear either to work, for walking or for any other activity of your choice. And only boots which fit your feet well will bring on this happy feeling! 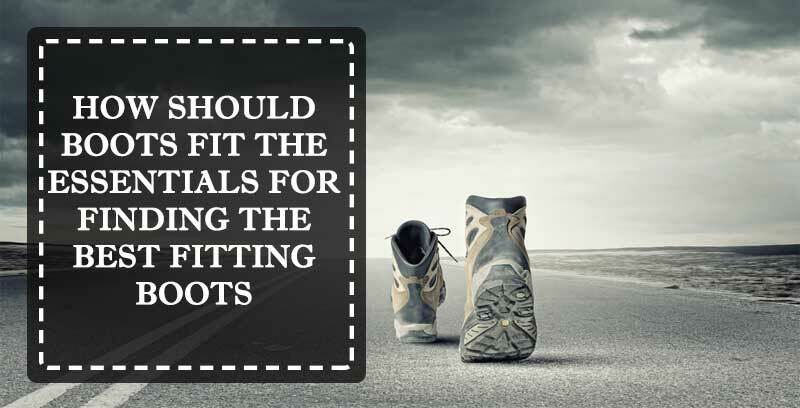 Having to walk or work in ill-fitting boots can turn into a painful and miserable experience, which will hinder your performance and wellbeing and can lead to serious pain, blistering and more long-lasting foot problems and injuries! Take extra care for your feet, because they are responsible for carrying around your whole body weight form one point to another and for dealing with the stress of the impact on the hard ground all day long! Find the best fitting boots and your feet will thank you!